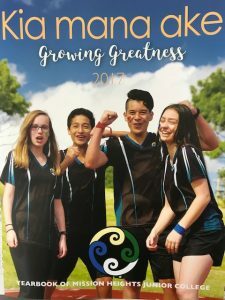 I am extremely pleased to announce that every family at MHJC will be receiving a copy of the first edition of “Kia mana ake”, in the last week of term. This is an outstanding publication which captures so much of what makes MHJC a special place for our students. Please enjoy this early “Christmas present” from and on behalf of the Board of Trustees.